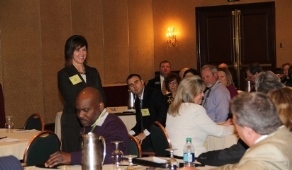 Amy listening to the Pennsylvania Realtors Association members practicing their PAC pitches. 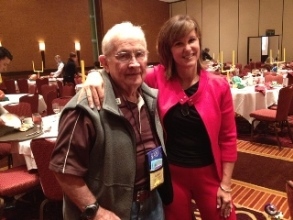 One of the “perks of my work” is meeting inspiring audience members like Scooter, a WW II Special Forces veteran, who attended the Texas Association of Realtors annual PAC convention. Prior to starting her consulting practice, Amy managed the Nationwide Civic Action Program for nine years. Under her tenure, over 2,000 public affairs professionals in the country rated it as one of the top two corporate grassroots programs in the country. (Ed Grefe and Martin Linsky, The New Corporate Activism). At Nationwide, she collaborated with and hired consultants and trainers to help develop her grassroots members’ political acumen and motivation. While she experienced many successful collaborations, she realized that many of the speakers were either reading their text, or providing the exact same speech year after year-complete with the same tired jokes. Amy knew that audiences today are sophisticated, demanding, and require interaction and innovative content. She also recognized that audience members need to know not just how to communicate with and educate lawmakers, but more importantly, how to influence them. Unlike other organizations, TSG does not consider “customized training” to be programs that are pulled off the shelf and presented with your organization’s name thrown in during the training. You tell us your highest priority outcomes and we reverse–engineer the process to design a curriculum that produces your highest priority outcomes. All of our efforts are custom-designed based on learning outcomes that reflect comments and feedback from the actual trainees and staff that we collect prior to the training. We do, however, offer numerous signature programs that use formats we have refined over time as the starting point for your custom-designed effort. Several of our workshops are based on proprietary TSG grassroots research offered only through The Showalter Group, Inc.
Click here to view these workshops. We take our clients from activity to achievement. We don’t believe that “grassroots advocacy” or “PAC fundraising” represents what should be your ultimate goal: grassroots and PAC persuasion. We believe it’s about the result, not the activity. Here’s how we do it. How many times have you or your staff made the ubiquitous “legislative update” or PAC presentation? How many times have you left feeling your audience did not understand, and certainly did not appreciate your message? I learned that public speaking is a conversation and that no one wants me to fail. Amy has energy and enthusiasm for the subject matter and provides concrete suggestions that you can immediately implement to improve the next speaking engagement. It was time well-spent.”* –Jessica M.
The class was such a positive confidence boosting experience. You have such a skillful ability to gently lead each person to a genuine, lifelong improvement. I valued all components of the day and learned so much from you and from the other participants. It’s a great group and appreciate the small, comfortable size. I loved the inside tips on presenting, especially storytelling, and the importance of always collecting ideas for stories as a part of everyday events. Appreciated the time for delivering my speech and getting the team’s feedback.”* –Kelli P.
Amy's thorough and thoughtful approach to presentation coaching enabled me to deliver a major presentation with great success and high-impact results. Amy challenged me to highlight key points with proven techniques instead of just saying words. I've never delivered a presentation with so much confidence and credibility. As a result of this presentation, I have unprecedented support for my strategic plan and am working to build a movement within our grassroots program.”* –Suzanne P.
I liked the ‘winning them over before you say a word’ section and Amy’s suggestions for improving my biography and my mini speech. The training was excellent. I learned so much about how to leverage my personal strengths to connect with my audience and to deliver an effective presentation.”* –Alyia G.
I loved Amy’s tips about how to and not to use Q&A. I’ve never heard that advice before.”* –Mike A.
I loved the multi-dimensional format. I have participated in public speaking workshops and media training, but never as in depth as this. It was more supportive, effective, and less stressful than other workshops I've taken.”* –Kim C.
The small group size and personal attention was nice. I feel more confident. I love this workshop because it was very fun and very helpful. I only wished it lasted longer.”* –Joseph R.
Being able to galvanize stakeholders beyond your online messaging and printed materials will give you an advantage over your opponents. Your opponents likely use the same tools that you use to motivate and organize your stakeholders. Thus, the abundance of the same techniques on both sides of an issue dilutes the impact of each technique! What can differentiate equal amounts of money, staff resources, and strategy is a person who can motivate and coach their grassroots activists to become raging, relentless grassroots thunder activists. If you believe, “It will never change, they just don’t understand what we do,” you are mistaken! Remember—effective testimony to a local, state or federal agency is not the same as making a compelling presentation to those you also need on your side – your employees or members. higher personal and departmental visibility within your organization. We are so confident of our ability to improve and transform your presentation skills that this service comes with a full money back guarantee. Amy Showalter is a highly rated presenter who has galvanized thousands of grassroots enthusiasts, PAC peer recruiters and public affairs staff to advance their cause politically. She is the only grassroots and PAC trainer who has actually lead, motivated and coached PAC recruiters and grassroots volunteers in the real world. She knows your challenges because she has lived through them. “A good friend referred me to Amy speech coaching to prepare to present my Capstone project before an academic board for graduate school. Amy provided me with very targeted coaching that prepared me to present my work with confidence and command. I was so grateful for this help as it made all the difference in my ability to successfully complete my graduate school studies.” –Kelli M.
What's the business case for a presentation by Amy Showalter? We know that you have to justify every meeting investment. Your reputation and stakeholder involvement are “on the line” in many conferences. It is imperative for government relations professionals to show a training ROI. Here’s how we help you get the most for your investment. 1. Willingness to Measure Training Results – Amy knows that you put your reputation on the line every time you hire a speaker. The goal of her presentation is behavior change, and she will measure the “before and after” habits of your attendees to ascertain the true ROI of your training investment. 2. Audience Recognition — Amy will interview your meeting attendees in advance so that she can feature their successes and challenges during the presentation. This makes your meeting participants an integral part of the presentation, and provides meaningful recognition to your star volunteers. 3. Thought Leadership — Amy’s insights have been featured in over 500 publications. Her blog “Politicking the Bottom Line” appears on Forbes.com, and her work has been featured on CNNMoney, cnbc.com, Foxnews.com and Politico. She is also the author of five books, including The Underdog Edge: How Ordinary People Change the Minds of the Powerful… and Live to Tell About It (Morgan James), and “The Art and Science of the BFF: 105 Ways to Build Relationships on The Hill, at The State House, and in City Hall” which has sold over 17,000 copies. 4. Amy Has Been a Government Relations Practitioner — Amy is the only grassroots expert who has actually led a highly esteemed grassroots organization which was ranked as one of the top two in the nation. (Grefe & Linsky, The New Corporate Activism) She knows about the challenges of gaining internal supporters, internal politics, and implementing new programs because she has lived through them. 6. Focus on Creating Internal Evangelists — Amy’s methodology empowers and equips your stakeholders to create momentum and motivation you need to propel your movement. By having them share their persuasive PAC narratives or their grassroots story, Amy helps your stakeholders multiply their impact.